Famous actors Halil Ergün, Cem Özer, Tarık Akan had also attended the event. Habervesaire has published a good photo galery here. The Sunday editions of Turkish newspapers were dominated by headlines related to the previous day?s celebrations of a peaceful May Day in Istanbul?s Taksim Square. This year’s peaceful May Day showed that the security and provocation concerns cited in previous years to keep celebrations out of Taksim Square were all unfounded. After I finish writing this article, I will hit the road from Ankara to İstanbul in order participate in the May Day festival in Taksim Square. Anyone who lives in central İstanbul wants to avoid any risk of trouble at Saturday?s Labor Day demonstrations in Taksim Square, the first since the bloody one of 1977 in which dozens of people died. More than 200000 people celebrating May Day have gathered for the first time in 33 years in Istanbul’s Taksim Square, where dozens were killed decades ago. As a peaceful May Day celebration in İstanbul?s Taksim Square came to a close on Saturday, Turkey breathed a sigh of relief as fears about an outbreak of violence proved to be unfounded. May 1 has always been a source of tension in Turkey, where it had not been celebrated as an official holiday since the Sept. 12, 1980 coup. Just came back from Taksim. It was a peaceful and playful celebration in general. There are probably some minor incidents but things went smoothly.Our union (Bilgi University employees) also attended and ours was joyful, too. but most of us were first timers and I guess next year we might be more creative. Bilgi photos to come. These are some of the major headlines and their summaries in Turkish press on May 1, 2010. The Hürriyet Daily News does not verify these stories and does not vouch for their accuracy. Labour Day Finally Back in Taksim Square! For the first time in 32 years, Taksim Square was open to the public for a celebration of the labour movement and a call for more rights. 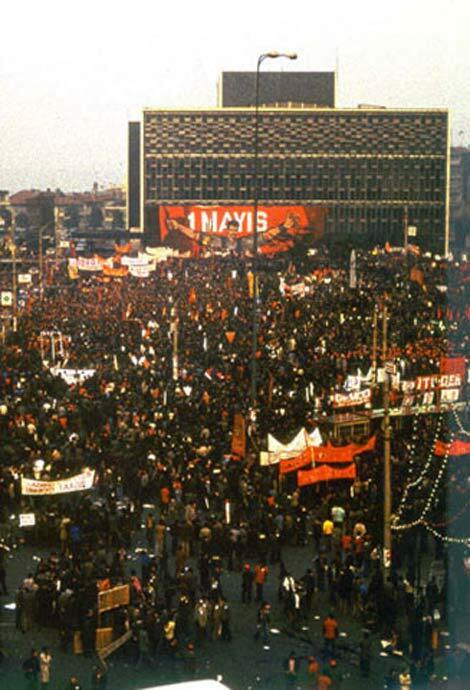 For the first time since 1977, May Day will be celebrated in İstanbul?s Taksim Square. Before the event started police searched the square carefully. more photos of police preparations here. A history of May 1 celebrations in Turkey with old photos here. Bloody Sunday  (TR Kanlı Pazar) is the name given to a counter-revolutionary response to a leftist protest that occurred on February 16, 1969, in Istanbul’s Beyazıt Square, Turkey. A coup d’état in 1960 had allowed a group of Turkish military officers to take control of the country. Under this established government, labor tensions grew and anti-American sentiment rose. Elements of the Turkish left and labour movement were protesting against perceived American Imperialism. Protests increased after the United States Sixth Fleet arrived in Turkey. 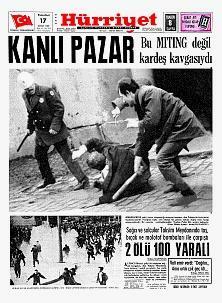 Unrest peaked on February 16, 1969, when 30,000 people marched on Taksim. The demonstration was broken up by the police, but several thousand continued the march towards Taksim. It was at this point that a counter-revolutionary force attacked a large group of these protesters with knives and sticks. During this confrontation, two protesters, Ali Turgut and Duran Erdogan, were killed. The Taksim Square massacre relates to the incidents on 1 May, 1977, the international Labour Day on Taksim Square in Istanbul, Turkey. Finally, the authorities allow workers to celebrate the Labor Day at Taksim square as in the very old days. In one of the shameful days of Turkey’s history, in 1 May 1977, possibly right-wing deep-state related agents shot at demonstrators and 34 died and 136 wounded in the ensuing chaos. Since then Taksim Square is not allowed to celebrate the Labor Day and every year police clash with left-wing activist. ..About the Bloody Labor Day check the wikipedia site in Turkish. The police prepares for the Taksim meeting. Many famous artists are attending the meeting in Taksim. In English here. Acknowledge Women’s “Invisible Labour” on 1 May! Filiz Karakuş, Necla Akgökçe, Yıldız Ay and Nilgün Yurdalan call for the acknowledgement of male hegemony on Labour Day. Finally the government has given up its rejection of labor’s demands. For the first time since 1978, Taksim Square is opened for a mass celebration of Labor Day. 16,500 policemen will be in charge. The Governor of Istanbul engaged more than 22,000 policemen for 1 May. Union representatives will be at the check points. Six union confederations will gather at Taksim square after a converging demonstration. The whole area will be closed to traffic.